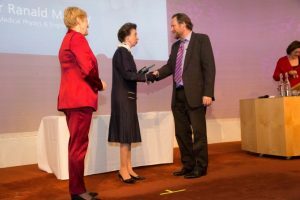 Together with Her Royal Highness, the Princess Royal, the 2018 Chief Scientific Officer’s Award’s Ceremony held in London on 5 March 2018, recognised the achievements of healthcare scientists working across the National Health Service. 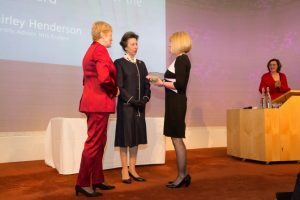 Hosted by Vivienne Parry OBE, Writer and Broadcaster, the Awards were an opportunity to learn more about how healthcare scientists are making a difference. Professor Mackay has been presented this award for the work he has undertaken to bring proton beam therapy to the NHS. He has led the introduction of this state-of-the-art technology in Manchester enabling cancer patients to receive high-energy proton beam therapy on the NHS. Dr Henderson was recognised for her key role in the 100,000 Genomes Project. Shirley led work to review DNA extraction protocols, which has resulted in a major shift in tissue handling from the routine formalin fixation, that most people are familiar with, to fresh frozen. As a result of her work, the programme is now recruiting hundreds of patients each month for whole genome sequencing which is pushing forward the boundaries of understanding of cancer genomics. This prestigious award was presented to three exceptional individuals who have used their skills and scientific ability to maximise patient/service user benefit over the whole of their career. Dr Ison is known to be one of the most thoughtful and reflective leaders in healthcare science. He has a passion for professional leadership development informed by his career in healthcare science (including President of the Institute of Physics and Engineering in Medicine) and the time he spent outside the profession, in hospital management. The judges considered his breadth of experience, his emotional intelligence and his ability to reflect, all important aspects of making him an outstanding mentor and leader. Professor Hyde has had a long career in pathology specialising in haematology. 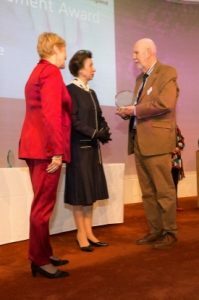 He worked globally as the former director of the UK External Quality Assessment scheme for general haematology and fetal-maternal haemorrhage scheme as well as being a former Director at the World Health Organisation’s collaborating centre for quality in haematology. In conjunction to his global work he has been a constant leader in the transformation of pathology across Manchester. Dr Gillian Manning has had a career of two halves, as a healthcare scientist specialising in cardiac science and as an educator. She led the development of 80 healthcare sciences curriculums across the career pathway (from associate to doctoral level) within the Modernising Scientific Careers Programme. Her work was also considered instrumental in developing apprenticeship standards for the healthcare science profession. The Shirley Fletcher CSO Apprenticeship Award has been established to recognise and commemorate her significant contribution to this work. The judges looked for an apprentice who has shown a passion and commitment for healthcare science. Tyler was recognised for his role as an apprentice at King’s. where he excelled in respiratory medicine and showed a natural affinity with patients and staff. His supervisor commented: “He is an asset to the unit, the patients respond to him well and he gets the results we need. We are delighted to be able to set him on a path to becoming a qualified Healthcare Science Practitioner”. This award celebrates those healthcare scientists in the early stages of their career who are already demonstrating how much healthcare science can bring to care pathways and service development. Chloe has been a Biomedical Scientist in Histopathology at Leeds for three years. This year she took a Leadership and Management Fellowship in digital pathology. This award recognises the passion and enthusiasm she has demonstrated as the scientific lead when delivering one of the biggest laboratory digitisation projects in the world. Chloe implemented an entire digital workflow, training schedule and created evidence required for digital pathology ISO accreditation. This award champions healthcare scientists who are working in partnership to develop clinical innovations or enterprises, and in turn driving the revolution to transform the NHS. Professor Clark is the driving force behind the Centre for Healthcare Technology (partnership between University of Nottingham and Nottingham University Hospitals NHS Trust). The Centre works with stakeholders to address major healthcare challenges using technology to provide long-term strategic value to UK industry and creates a pathway from curiosity driven science through to clinical application with the aim of rapidly translating scientific discoveries into healthcare. Since its launch there have been over 70 associated research groups and the centre has supported/ developed over 100 industry-based medical technology projects. 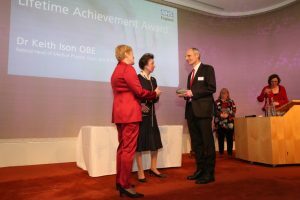 This award celebrates those clinical academic healthcare scientists who have undertaken ground-breaking research and who have in turn established strong foundations for scientific innovations to make a real difference in patient care. Professor White has been recognised for the pioneering cardiovascular research which demonstrates it’s possible to use circulatory donors as a source of hearts for transplant and then found the best way to transport them. This research has not only made a significant contribution to UK donations but it has also gone on to be translated around the world. The CSO is keen to champion a fully inclusive leadership culture within healthcare science that better represents the demographic of our country and showcases the depth and breadth of diversity across the NHS. This award supports that ambition and is for inspiring leaders who have lead the way for others and acted as role models for a next generation of healthcare scientists. This award celebrates healthcare scientists who in different ways exemplify the “new relationship” in their work. This includes for example: understanding what really matters to patients and families and using this intelligence to shape their approaches and activities. Emily has been awarded for her work as an audiologist on the EU funded Horizons 2020 project 3D Tune In. This project focuses on designing serious games for hearing aid users to learn about their hearing aids in an empowering and interactive virtual environment. The work demonstrates a successful participatory design process with not just bringing together hearing aid users, their families but a whole range of different experts too to shape the approach. This award is for a project that demonstrates a link between an innovative approach to delivering course content and clear improvements in learning outcomes and/or student satisfaction. The BSc Healthcare Science degree (launched in 2017) covers the life science disciplines and has been specifically designed in close collaboration with a range of regional and national NHS partners to support sustainable scientific workforce planning within clinical pathology laboratories. The innovative delivery and content of this programme brings together Ian and Angela’s experience of distance-learning delivery, the knowledge and skill of practice-based educators and provides a focus on patient-centred innovation and quality improvement. It is crucial that science and innovation is placed at the heart of the NHS to deliver the five year forward view. This award recognises the development of the vital contribution of science to healthcare delivery.